This richly illuminated manuscript book is one of the most precious treasures of Leiden University Library. Made at the court of Louis the Pious at Aachen in the second quarter of the ninth century, it bears witness of the great interest of the Carolingian emperors in classical antiquity. 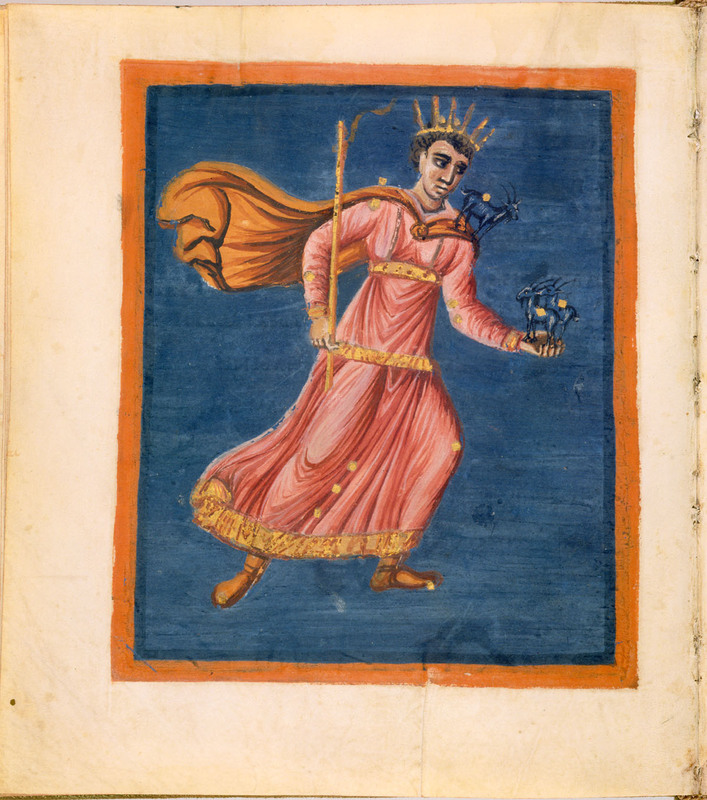 The codex contains a Latin didactic poem about astronomy, written by Germanicus (15 BC - 19 AD), based on the Greek poem Phaenomena by Aratus of Soli (c. 315 - 240/239 BC). Especially noticeable of the Leiden Aratea are the 39 full-page miniatures. Proven by the style of these miniatures, the manuscript derives from a late antique exemplar. Look for example at the fluttering robes of the figures. The red frames are typical for the miniatures of this period as well. The spacious lay-out of the book, too, makes it clear that this book was meant for someone at the royal court. It was probably not supposed to be read by an individual sitting by the fireplace, but it was meant for display. Around 1000 the Aratea probably belonged to the abbey of St. Bertin in Northern France. This is indicated by two copies of the manuscript that were made here around this time. Later, the manuscript was owned by Hugo Grotius who used it for his Syntagma Arateorum , an edition of Aratus’ text and the Latin versions of it. Via the collection of Isaac Vossius, the manuscript finally came into possession of Leiden University Library.